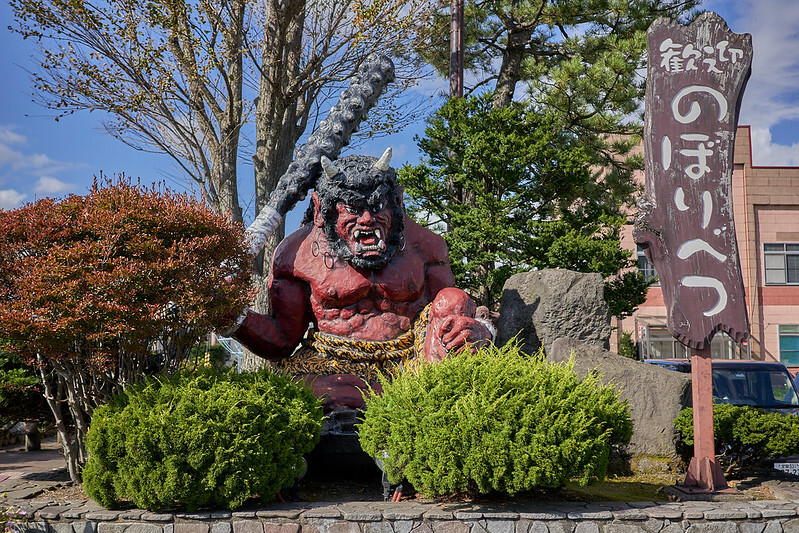 Another few trains and a bus ride later we arrived in Noboribetsu, also known as “Demon City,” which welcomes you with a big angry club-wielding demon at the train station. A good dentist could really clean up in this town. On the bus ride to the hotel we went past a giant blue demon, like Paul Bunyan’s evil brother at a Duke game. I wasn’t quick enough to get a photo of that, but he appeared again later in the forest (albeit smaller). Why all this devil worship? 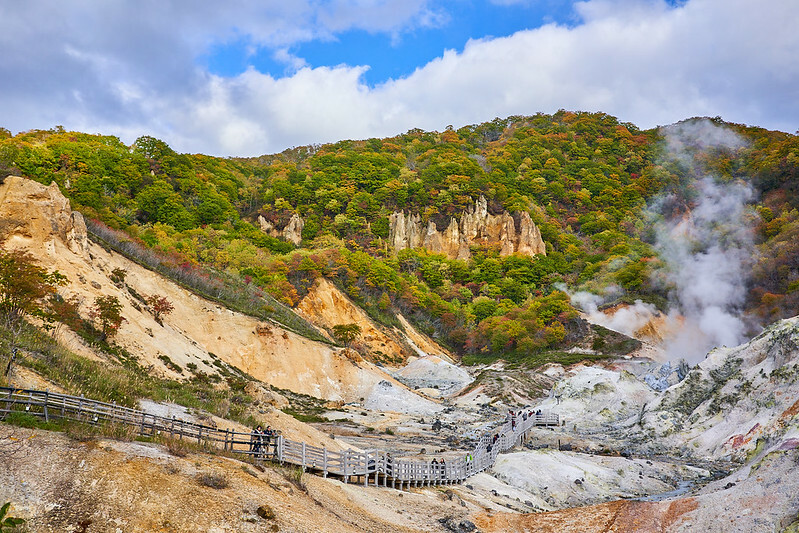 Noboribetsu’s claim to fame is the natural sulfur hot springs that bubble up out of the mountain. Over time, the Japanese assigned what I guess you’d call mascots to the phenomenon (they tend to do that with everything, but usually are cute, not demonic) and demons were an obvious choice, especially since the valley between the mountains became known as Hell Valley due to the sulfur. We checked into the hotel and hiked to Hell Valley. We walked to the top of the hiking trail and The Fam, eager to disrobe in front of each other, decided to go back to the hotel to check out the onsen. 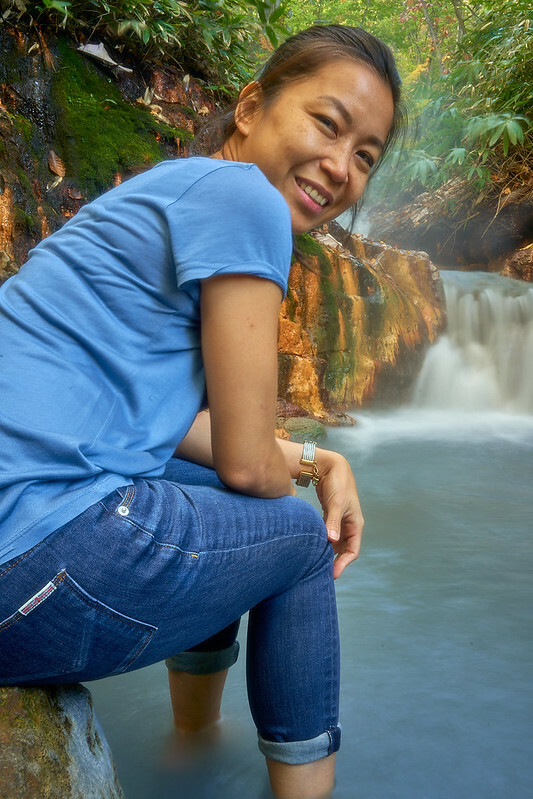 Sam and I continued on through the forest and discovered a natural onsen at the foot of a small waterfall in the valley. Only the shoes had to come off at this onsen! We took our shoes off and walked into the hot (but not too-hot) spring. 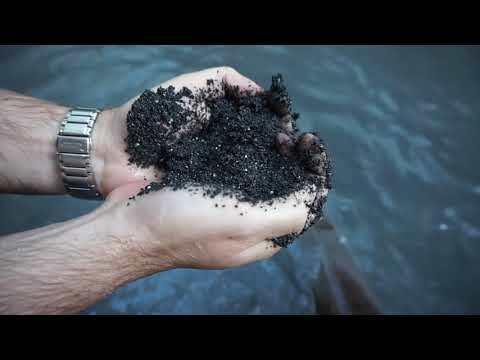 The rocks under the water were fine-grained volcanic leftovers. At least I think. They were black and cleaved into tiny spheres. 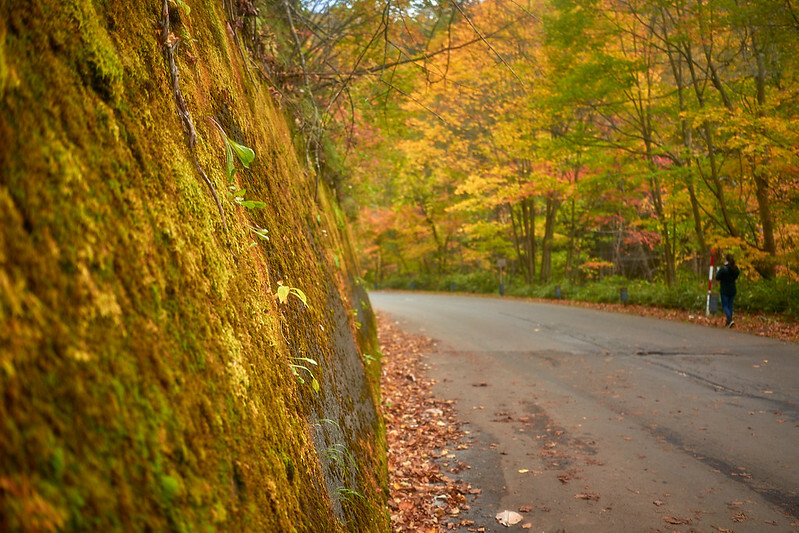 After relaxing there for a while we walked back down the mountain road among the fall foliage to the hotel. I did not use instagram’s “pumpkinspice” filter on this, I swear! 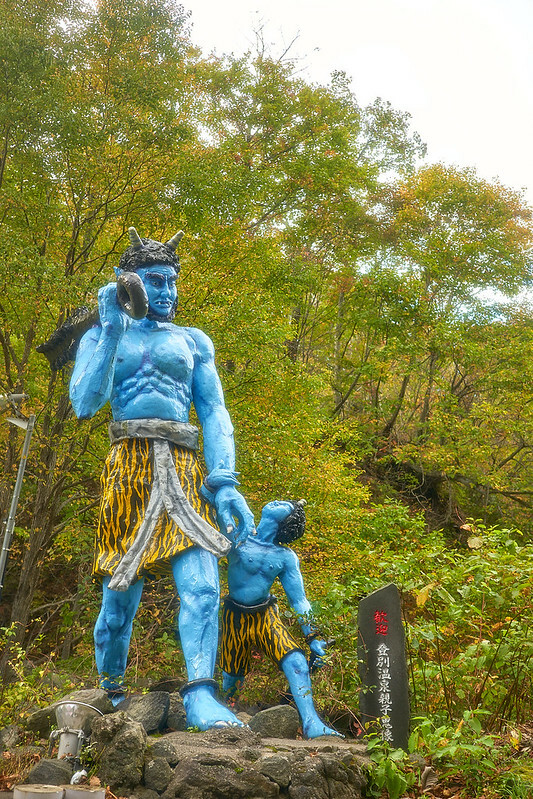 On the road we passed another statue of the blue demon, this time with child (and much smaller than the other statue). Coming upon this after dark might be a little creepy. Back at the hotel we had time to kill before our pre-purchased buffet dinner so we visited the onsens (separate for men and women) at the hotel. Yes, that onsen, where you have to get naked. Turns out, though, that the locals (or, as some claim, the experienced Chinese tourists) bring down the face towels from their room and use those to cover certain areas while walking around. Having no idea this was the custom, I followed the directions the hotel gave us and left all my worldly possessions in the locker room…including breaking Douglas Adams’ number one rule of travel: always bring a towel. Because of this, I strolled right out into awkward eye-contact with Sam’s brother-in-law. Fun. I don’t think I need to do this ever again. I expected a bunch of old dudes laughing it up in there, but nobody else at the onsen seemed to be having much fun either. In one of the pools I looked up to discover windows in the adjacent hotel could see right into the onsen. More fun. No thanks. After that experience, we dressed in matching yukatas and attended a grand buffet. This was after our first trip to the buffet. Before we discovered the fish. And the alcohol. The “regional” dishes on the buffet were just okay, but I honed in on the tuna and salmon early because the fish there make for the best-tasting sashimi in the world (that I’ve had so far). I must have eaten a whole salmon and they just kept bringing it out. And the tuna. And the red king crab legs. We chased it down with Yuzu (a lemon-ish sour local fruit derived drink so nice we bought two bottles to take home) and a surprisingly well-done dessert table with chocolate cake and (perfect) cream puffs and all sorts of other sugary things. 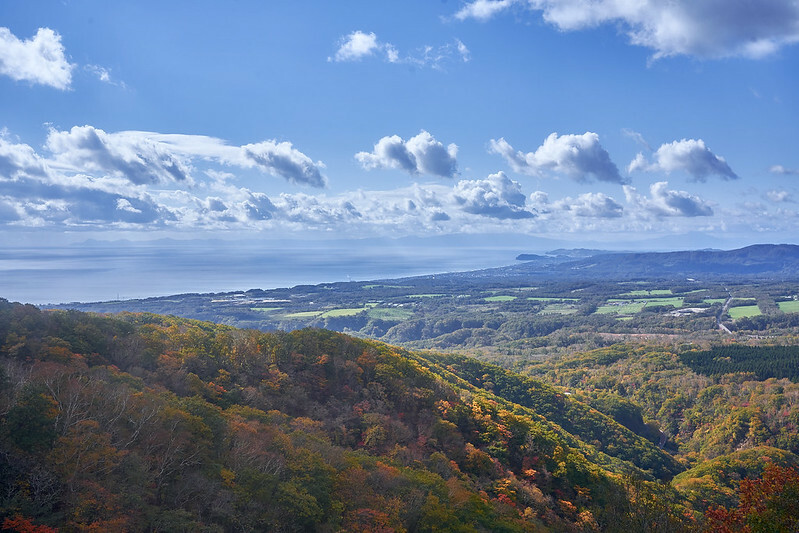 As the internet saying goes: 10/10 would come to Hokkaido again just for the fish. The room cost including buffet breakfast and dinner and onsen use was roughly $200 for one night. In Los Angeles, a meal for two with that much sashimi ain’t gonna be $200. Maybe $200 per person…but not in the quantities we were gulping down. In the morning, we went to the Bear Park on the top of the mountain via the ropeway across the street from the hotel. Maybe this is what the M.O.V. will look like after global warming permanently floods out the Ohio River. 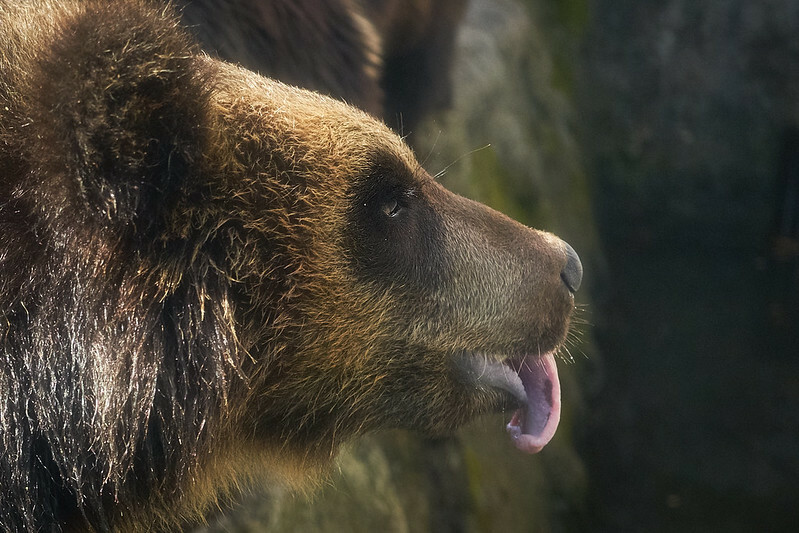 The bears are so accustomed to people that they raise their hands and point at their mouths to ask for acorns and dried salmon chunks. 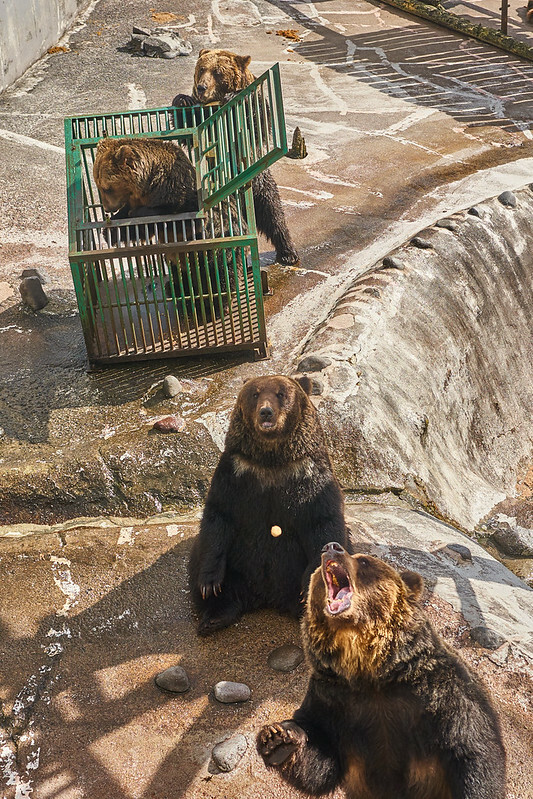 Despite all my rage I am still just a bear in a cage! Inside a larger cage. With larger bears. So, cageception. Not to be confused with this cageception. The Japanese in Hokkaido have incorporated the bears into another type of mascot: the Melon Kuma, which combines their regional seasonal “melon” (which my Ohio raised taste buds and eyes call a cantaloupe) and their bears. The result?